I was hoping for a heartwarming Christmas story when I read "A Christmas Beginning", part of Anne Perry's "Christmas Stories" series. But the book was a short cozy mystery. The only reference to Christmas was that the main character has time off from work around the holidays.Superintendent Runcorn is spending his holiday time on the isolated island of Anglesey, located off the northwestern coast of Wales. He enjoys walking, and explores the beautiful island while he is staying at a boarding house. One morning he discovers a murdered women, the sister of a clergyman, in the graveyard. Runcorn helps the local constables with their murder investigation since he is more experienced in that type of work after many years in London.The lonely Runcorn also gets reacquainted with Melisande, the only woman he has ever loved. She lives on Anglesey with her brother who belongs to the landed gentry class. Runcorn comes from a lower class so he has never told Melisande of his love. Runcorn is told by the supervising constable to be extremely tactful when questioning the upper class friends and family of the free spirited murder victim. Is something being hidden?This is a cozy mystery with a touch of romance and a likable main character. It's a short, fluffy read that's not especially memorable. 2.5-3.0 stars. I enjoy these short little christmas stories, even though I am Jewish. They are good character studies and you needn't have read the series, although there are some spoilers. I have not read the Monk series, but still enjoyed Superintendent Runcorn and his dilemmas. The christmas stories always have a happy ending, usually involving a love story. I listen to the audio books, which are usually short, though I did read the most recent, Jemima's story, even though I am only on about number 5 of the series and she is still a little girl. The Victorian background, the class differences and how people overcome them, plus the mysteries are what keep me reading Perry, who I just discovered in January!! Many books to read. Clearly a book written for fans of an existing series of which I have never read, and given the weakness of plot in this "valentine," now won't bother with. Out of all the books that I have read in this series, I really liked this one the best so far. Runcorn of Scotland Yard is spending Christmas on the island of Anglesey off the north coast of Wales.A woman is found--murdered.Runcorn finds himself investigating this case.I've enjoyed the books in this series. Characters are developed to deep levels. Olivia, the woman murdered, was full of charm and grace. This also was a story of love. Runcorn has never forgotten Melisande Ewart. Tension builds as the story progresses. Who did it? Red herrings are placed throughout the story. I loved it. It's a cosy enough Christmas-time Victorian murder mystery, although nothing amazing. It was the first book by Anne Perry that I've read and I wonder if I'm missing something because she kept referring to another character/detective, Monk, who isn't in the book, as well as a past investigation that had involved three of the main characters. So maybe these characters and plot have been previously developed, and would so mean more to people who have read the other book, whatever that may be.It's set on Anglesey, the Welsh island, and Detective Runcorn, a man in his fifties, has come for his holidays from London. So he takes to strolling about on the windswept beaches and along the coast and brooding about this woman he met during a previous investigation, Melisande, whom he is madly in love with. Goodness though, Melisande and her brother are in a rented property in the village and Melisande is engaged to another man! Then the vicar's sister is murdered and even though he's on his hols, he helps out and investigates. If it had just been that it would have been fine but there's this supposed love story in it, which lets it down. They have a couple of brief conversations about the murder, then literally on the last page she says to him, why won't you tell me that you love me; er, ok, I do; great, lets get married; ok! THE END. What?! Hmm, is what I have to say to that. This novel had little to do with Christmas, except that a murder took place about that time of year. While on holiday, Superintendent Runcorn stumbles upon the dead body of the vicar’s lovely younger sister. He investigates the murder, a difficult task since he must be careful not to tread upon people’s sense of propriety and honor. The novel is short and yet parts of it seem to drag on. However, the conclusion and the fact that Runcorn may actually find love at his somewhat advanced age makes it a worthwhile read. I love these Christmas novels/novellas and eagerly anticipate each year's offering. I love the way she takes minor characters from her two main series (Monk and Pitt) and weaves a story around them. This one features Inspector Runcorn from the Monk series. It's the kind of book you can read each year and still enjoy thoroughly! I liked this book, but it ended too abruptly. I was just getting the feeling that I knew some of the suspects when the villian was unmasked. Still, it was a nice easy book to read and it is near Christmas, so it was timely. I liked getting to know Runcorn better and to see the mystery from his eyes. I'm also glad he finally got some happiness in his life. Last December I was struggling to find a historical fiction novel that had a good mystery and involved Christmas in some form. Goodreads kept recommending Anne Perry, and I picked up a few of her novels at the local library. Sadly, there was always something that had me putting the books down by the end of the first chapter. I just couldn’t embrace the characters, or the mystery didn’t intrigue me. I finally picked up the audio version of A Christmas Beginning and it satisfied my Christmas mystery needs.I won’t provide a summary of the story as the synopsis above does a pretty good job, but I do want to start the review by saying that I wasn’t a huge fan of A Christmas Beginning. With that being said, I am going to state the positives first. I really liked Superintendent Runcorn. I found his gruff personality, subtle kindness, and struggles with self confidence endearing and I would probably love a tv show staring him. He wasn’t perfect, and that’s is what kept me reading. I also enjoyed the murder mystery. The brutality of Olivia Costain’s murder was shocking and stark for the setting, and it may seem morbid, but it was perfect. I was glued to the investigation because 1. I had to know why this murder happened the way it did and 2. I wanted Runcorn to succeed so badly.Now, you may be asking why I wasn’t a huge fan of this novel after those last two points. It’s because of the writing style. There were times when the prose was tedious and repetitive, and I lost count of the number of times Runcorn was reminded of his social standing and the proper way of everything. Yes, I know it was a different time with different social rules and groups, but the reiteration of this point every few minutes was downright annoying. I also felt aspects of the investigation and reveal were too hurried, which in my opinion, diminished the brutal effect of Olivia’s murder. When I think back on the story months later my initial response is ‘eh.’Will I be reading another Anne Perry Christmas story this December? Nope. But, I do want to hear from those who love this author and her stories as she is such a staple in the historical fiction community. 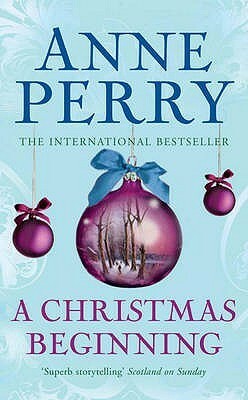 Please let me know your recommendations, because I loved Runcorn enough to maybe give Perry another try.What are you reading this Christmas?LindsayCheck out more reviews at www.HistoryMysteryBooks.com! While I definitely don't read them in order, picking up an Anne Perry Christmas mystery has become a yearly tradition for me. She blends together Agatha Christie style murder (just enough brutality not to feel anemic, simmered with psychology and rationality) with a richly rendered snapshot of Victoriana (with a surprising amount of variety in the vistas), and a hefty, contemplative dose of musings on the emotional and theological realities of Christmas and human nature. A Christmas Beginning follows Runcorn, a self-confessed plodding and less than imaginative policeman who finds that a brutal murder has followed him to his Christmas retreat in an isolated island village. He would rather stay uninvolved, but the woman he loves (but cannot have) asks him to assist the local authorities, and he is powerless to refuse. The story focuses on class dynamics and the cage of societal expectations. Since Runcorn is not a member of the social class of the victim and her associates, he has trouble navigating the world with its myriad unspoken rules. Perry does an excellent job making class barriers feel very real and powerful to a readership that largely lives in a classless society, and the quiet romance between Runcorn and Melisande is equally evocative. The actual mystery, however, feels a little thin. Maybe it fits the narrator to have it be a plodding sort of case, where the puzzle pieces are painstakingly slotted in until the picture is complete, instead of having them all cascade into place in a glorious avalanche of understanding, but it's much less satisfying. Until the last minutes of the book, I wasn't even certain it was the correct solution. Other aspects of the story ended much too abruptly as well. I needed more closure between Runcorn and Melisande, more of how her brother and others would react to (view spoiler)[ their becoming engaged, how Faraday would react (did she already break her engagement to him? Is he going to accept it gracefully?) Will Melisande move back to London to be a policeman's wife? (hide spoiler)] Overall, an imperfect, but enjoyable Christmas treat. For a book that's mostly police interviews it really held my attention. I can't even put my finger on it. It was all about the characters and their relationships to each other in this small town in Wales. It's how their lives are woven together and about the clues that slowly unravel the mystery. Of course there are also all the underlying thoughts for Melisande that seems to affect Runcorn's every decision. What will Melisande think? Will it be good for her if I do this? I love the old-fashioned nature of this novel. It isn't filled with feminism or acceptance of modern morality. Not everything in history was good for women or should be praised, but the dignity and chivalry of the past should be honored and preserved. People addressed each other by their last names, married before having children, everyone went to church, etc. It's so refreshing to think that there could be a place in the world where this kind of living still existed. Not everyone will agree, I know, but I believe in all that wholesomeness we've lost from society. That being said, it was never revealed what time period this took place and nothing in the details gave it away. As I am not from the UK, I have no way of knowing if this kind of living is commonplace for the setting or if it is set fifty years ago or more. We Americans tend to think Brits are still the way they were 100 years ago. In any case, I almost don't want to know what year it's set. :) Do you? --> (view spoiler)[It's Victorian England. (hide spoiler)]The only problem I had with it was I just couldn't wrap my brain around the scenic imagery. It was very flowery and beautiful language but impossible to picture. Maybe this is because I've never seen Wales for myself. I enjoyed reading this so much I think I might read another of her Christmas mysteries next year!I will have to check out the Monk books. Some aspects reminded me of things in my own life and that made it a sentimental read, and for that reason, though I am picky about what books I keep, I am keeping it on my shelf. Not particularly "Christmassy" but quite wintery. Since I know nothing about the detective at the lead of this story, I had little advance info about what it would entail. Also, does she never give a year for the setting of her stories? It was a short, yet wordy, cozy mystery. I really wish that she would have had a short epilogue about the characters, say, their status 1 yr. later.I'm not sure if it was her intention, but she emphasized how much the women of that time were *not* allowed to do/feel/say, especially after marriage, that I became a little annoyed with their Victorian culture & its expectations. I never felt this annoyance after reading the Brontes' books, which are not about Victorian times, granted, but somehow they did not pound away against their own daily reality. I've read a lot of books by Anne Perry and I was glad to find this. It's a little different since it's told from someone else's point of view, Superintendent Runcorn. While reading these stories over the years, usually with Pitt as the leading character, I've often thought how difficult it would be to solve crime in England in the 19th century where the upper class doesn't have to talk to you if they don't want, no DNA, everyone pretty much not liking the police but still wanting their help. This story was no exception. Fun, quick mystery. I needed an audiobook to fill in the gap and the library suggested an Anne Perry book. This is a quick read and is a straight-forward police murder investigation and, to be honest, a bit old-fashioned. None-the-less, I found it an enjoyable change of pace. Superintendent Runcorn of Scotland Yard is taking his Christmas vacation in a desolate island off the coast of Wales. He finds a body of a young woman and has to deal with a pompous police Chief Constable, but persistence prevails and Rancorn carries on his investigation, whether sanctioned or not. One of the better short mysteries by Perry. I enjoyed the story of Runcorn's visit to a small island north of Wales during his holiday vacation. But when a young woman is murdered, Runcorn is asked to help the local police. Runcorn also runs into a woman he loves from afar, but who is now engaged to a local on the island. His heart is aching. But as he and she discuss the case, they find they are drawn to each other and know that there is a real person behind the murder. Will they discover the culprit before it is too late? And can they find peace in their relationship? My first Anne Perry book, & I’ll try another. It was a nice diversion from other authors I enjoy, I read it quickly, liking the author’s writing style. The story was simple & true. It wasn’t great, but it wasn’t a waste of three hours. I liked the descriptions of Wales & the countryside. Class distinctions were also eye opening. Terrence Hardiman did a fine job reading this mystery. Not much Christmas involved other than it happens to be that time of year. Interesting to read about the Victorian sensibilities and a detective's constraints trying to solve the murder. Short, quick read. Nice escape. This. book is not even about Christmas. It's a murder mystery that is quite boring actually. None of the characters were really developed so it was like..." who cares who the killer was". Will not read anymore in the series. This was a good book. It kept me guessing along with some insight into the age of Victorian England. It was a short read, but it had a depth of a much longer novel with theemotions and action contained with the story line. This was a short, fun mystery set during the Christmas season with little to do with Christmas at all. But the characters were interesting and the writing was thought provoking. I liked it, even though I really wanted a cozy heart warming Christmas story. Not really a Christmas novel. A murder that takes place at Christmas, but I was looking for a nice Christmas read. Other reviews warned of this, but I read it anyway. Book bogged down in middle, then rushed through the solving of the murder. A bit disappointing. Supt. Runcorn (from the Monk series), investigates a young woman's death on a windswept island off the coast of Wales. This book helped the reader get more insight into a character in the Monk series: Runcorn. Very enjoyable.